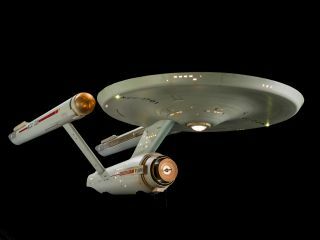 The iconic science fiction TV series "Star Trek" first aired on Sept. 8, 1966, chronicling the voyages of the starship USS Enterprise. The studio model of the ship (shown here), fully restored, is on display at the Smithsonian National Air and Space Museum in Washington, D.C.
A CBS-backed "Star Trek" Film Academy will allow fans to explore the "final frontier" by helping them make their own films, according to an announcement at the Star Trek Las Vegas Convention last weekend. Nathan Mattise reported at Ars Technica that the program will be in collaboration with "Star Trek New Voyages," a fan series that ran from 2004 to 2015. Productions will use the "New Voyages" sets in Ticonderoga, New York, and employ professionals who worked on other "Star Trek" shows. "Fans will work side by side with talented 'Star Trek' artists to create short vignettes from beginning to end," Star Trek Film Academy representatives said in a statement. "The adventure for attendees will start with preproduction meetings, go through rehearsal, lighting, costuming and makeup, all the way through to filming. Fans can participate in front of or behind the camera." The initiative marks the first time CBS has officially backed fan films since the series' debut on the network. It also comes a few months after copyright holders CBS and Paramount reached a settlement with the group producing "Axanar," a fan production that was intended to be a feature-length film until the copyright holders alleged infringement. CBS and Paramount recently released guidelines for fan productions that limited the length of films and the use of "Star Trek" uniforms and accessories, among other items. Details on how the film academy will fit into these guidelines, as well as prices and dates, have not been announced yet. Editor's Note: This article has been corrected to clarify that "Star Trek" did not debut on CBS in 1966; it was on NBC first.